New Kit 7756 EMD F59PH Locomotive Now Available! 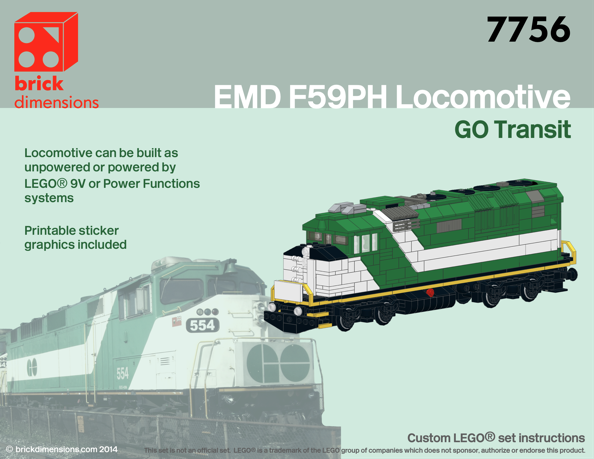 The custom instruction kit to build a GO Transit livery EMD F59PH diesel locomotive is now complete and available in the store. This kit features sticker graphics for the finished model with road numbers for 3 different locomotives. Furthermore, this kit can be built either unpowered or powered by either LEGO® 9V or Power Functions systems. The kit takes advantage of current parts available from LEGO® and strives to optimize the type and number of parts for ease of part procurement and ease of building. Hopefully this kit will prove enjoyable to build, and as always, any feedback on the model is much appreciated.